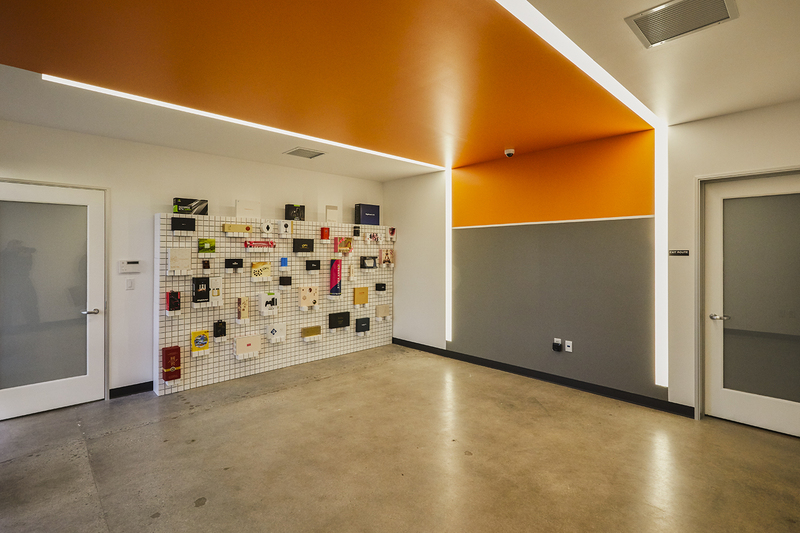 Toeniskoetter Construction - YUTO's Santa Clara Office Gets Modern "Repackaging"
Global printing and packaging company YUTO’s Santa Clara office has a bright updated look thanks to the revamp of their building interior by Toeniskoetter Construction, Inc. The fresh look features an upgraded lobby and conference room with a distinct YUTO orange-and-gray color scheme, as well as an open collaboration area that flows into a back work space. Construction followed the design from IA Architects, which created a singular open floor plan. Polished concrete floors and exposed ceilings with suspended lighting give the space a distinctly modern feel. One of the unique design features can be found in the lobby, where a strip of bold color snakes between two linear light fixtures. “We built a recessed track to create the dramatic illusion of light tracking across the ceiling and down the wall,” says Brett Johnson, Vice President of Toeniskoetter Construction and the project manager.